(Newser) – Ex-Minnesota Gov. 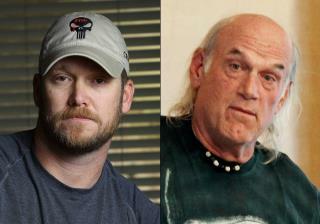 Jesse Ventura was set to collect $1.8 million from the estate of Chris Kyle, claiming the late Navy SEAL defamed him in his 2012 book American Sniper, but a federal appeals court nixed that 2014 judgment on Monday, the AP reports. In a 2-1 decision, the 8th US Circuit Court of Appeals nullified Ventura's $1.35 million award for "unjust enrichment," though it did call for a new trial for the defamation part of the case, which netted Ventura $500,000, the Star Tribune reports. The court said due to improper cross-examination of witnesses and comments made by Ventura's lawyer during closing arguments, Kyle's estate didn't get a fair trial, per Reuters. This is a great decision against Ventura. He did deserve the money. Maybe a slap in the face but he would have sue the wife of Kyle. And he would. Even if everything Ventura is saying is true, that he never said what was alleged, that the punch was never thrown, why can't he just be an adult and let it go? To pursue this, long after the death of Kyle, is shameless. It's all about bruised ego. My advice, Jesse. Get over it, grow up, get on with your life. Let bygones be bygones.